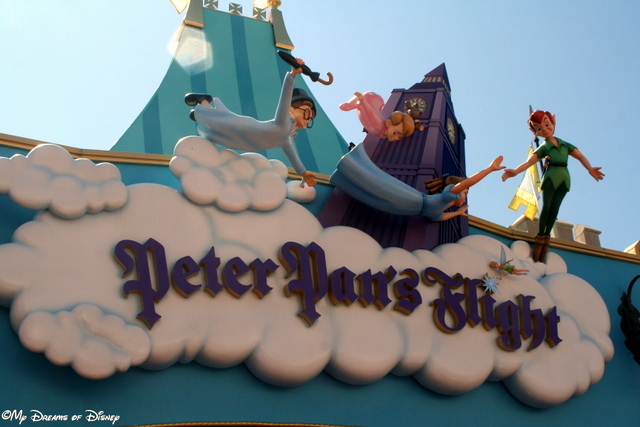 When it comes to the attractions at Walt Disney World, especially at the Magic Kingdom, there are few rides that compare with the excitement we get when we ride Peter Pan’s Flight, which is located in Fantasyland. With Peter Pan’s Flight, you get it all — a great trip into the classic story of Peter Pan, your own flying galleon to sail off into the night sky with, and a swashbuckling adventure! It always amazes me that the Imagineers were able to make such a realistic attraction. From the moment you take off, the use of forced perspective makes it seem as if you are truly flying! Of course, the Imagineers did create the ride so that your galleon is suspended from a track over your head, which certainly does make it easier to feel like you are flying! 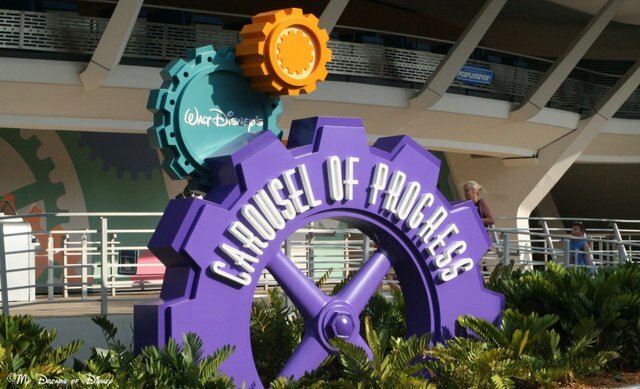 What do you and your family think of this great attraction? Please let me know in the comments, and thanks for stopping by today! Mickey’s PhilharMagic is one of my favorite shows at Disney! When it comes to shows, and incredibly cool ones at that, not too many rank higher than today’s choice for our #DisneyWorldCountdown. 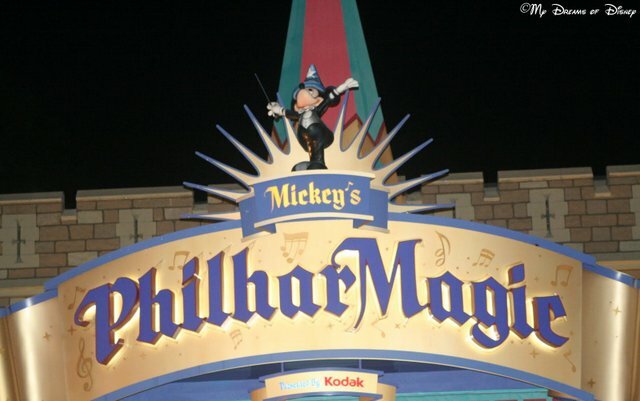 We are at day 98 in our countdown, and today we are taking a look at Mickey’s PhilharMagic — that incredible show that combines great music, incredible scenes from some of your favorite Disney movies, wonderful smells, and Donald Duck! Located in Fantasyland next door to Peter Pan’s Flight, Mickey’s PhilharMagic is a great way to get in out of the Florida summer and cool off, relax your feet for a while, and take in all the music you love from such movies as The Lion King, The Little Mermaid, Aladdin, Peter Pan, and many more! One of the columns just to the right of the movie screen. When it comes to great music, incredible movie scenes, and wonderful smells, Mickey’s PhilharMagic is right up my alley. Tell me, what do you think of it? Is it your kind of show, or do you skip by it? Let me know in the comments below, please, and thanks for stopping by My Dreams of Disney, where we strive to turn My Dreams of Disney into Your Dreams of Disney! Your Favorite Magic Kingdom Shows! 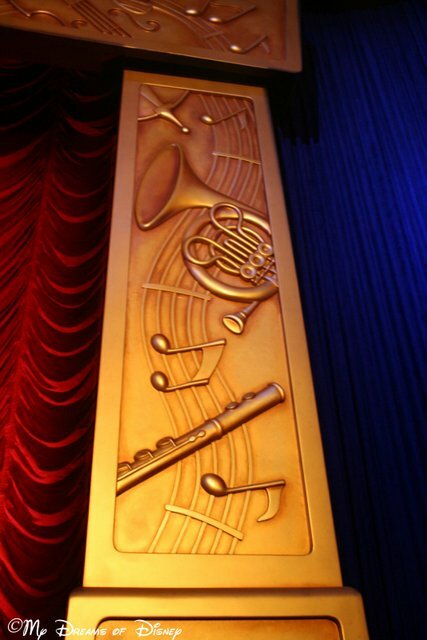 Last week we did a series of picture polls on our Facebook page regarding your favorite things at the Magic Kingdom. First we took a look at your favorite Magic Kingdom Mountain, and now we are taking a look at your favorite Magic Kingdom shows!